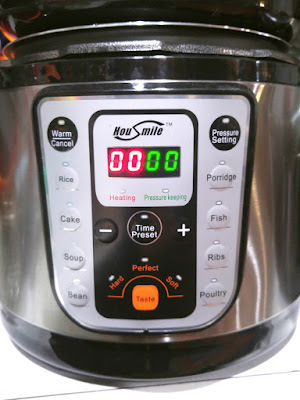 I've owned quite a number of pressure cookers, including both stove top and electric, so when Housmile contacted me and asked if I wanted to test theirs, I figured it would be pretty easy to put it through its paces. I mean, I've used so many different ones, this couldn't be too hard, right? So let's look at that front panel, shall we? It has a warm/cancel button, a pressure setting button, and presets for rice, cake, soup, bean (hopefully not one at a time), porridge, fish (in a pressure cooker? I think not), ribs, and poultry. There's a Time Preset button in the center, with plus and minus buttons. The plus and minus made sense, but I had no idea what the time preset was. Turns out, it's for setting a time delay. So you can throw stuff in the pot and have it start at a later time. But it only works with certain presets, because throwing meat in there and leaving it at room temp for many hours would be a spectacularly bad idea. There's also a "Taste" button with selections for hard, perfect, and soft. I figured that was for rice. What was missing from this layout was anything said manual - you know, for setting pressure and time manually. If you do want to set something aside from the presets, you can choose one of the presets and then change the cooking time. Aha! After some fiddling around, I figured out that the Pressure Setting button didn't actually set pressure to high or low, as many electric pressure cookers do. Instead, it sets the time for pressure cooking when you're not using a preset. So this is the manual time setting for pressure cooking at whatever pressure it cooks at. The box as well as online information claims that this cooker can slow cook and saute, but there are no buttons for those functions. The instruction manual is very sparse, and didn't include any information about how to invoke those functions, so I decided to do more testing to see if I could make magic happen. I found out that I could press a preset and the cooker would heat up without the lid on. Okay then, that's one way to get it to get it to brown some foods. I didn't test all of the buttons to see if they'd ALL work with the lid off, but it's an easy experiment if you own this pot. If I was going to live with it long-term, I'd test all the buttons to figure out what temperature each one reaches for the best saute. As far as slow cooking, since it doesn't need the lid on to cook, you could test the presets to see if any of them would cook at a simmer. Or you could put the lid on and leave the steam release open so it can't reach pressure. It might not be a slow cook, though, if the cooker is trying to reach pressure. But really, most people who have a pressure cooker don't bother with slow cooker functions, anyway. Maybe it's not all that important? 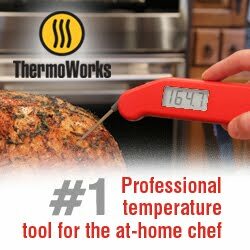 But since the box and online information say it can slow cook, I wish there would have been better information on how to make that happen. If it can happen. I'm really not sure. The Housmile pressure cooker page on Amazon describes the inner cooking pot as "Healthy, aluminium alloy inner cooking pot made from food grade 304, no chemical coating," which isn't accurate. First, "grade 304" refers to a grade of stainless steel rather than aluminum. And second, while the pot is made from aluminum, it has a nonstick coating. Which makes sense because cooking in an uncoated aluminum pot wouldn't be a good idea. I have a feeling they copied and pasted some of this from another one of their models and didn't check it for accuracy. There is also a 1000-watt Housmile pressure cooker on Amazon that has more functions and might be a better buy for people who don't want to experiment with settings. I haven't tested that one, and I have no idea if the instructions are better, but just the fact that the buttons are more logical makes it more appealing to me if I had to pick one of the two. Overall, this works well enough. I used it to make stock and to make soup, and it performed pretty much like I expected. But it would be a much better product if the instruction manual was complete, or if the company's website or Amazon information had better instructions. 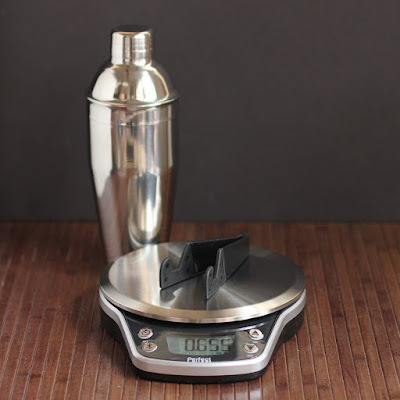 People who don't want to experiment or who aren't familiar with this sort of cooking appliance are no doubt going to be frustrated with scant information provided. One thing I really do like about this is how easy the lid seals. It's not quite as clunky as other cookers I've used. The pressure release is also quite nice, since you press a button and the steam releases at a valve that's a little distance away. Whether that's enough to make up for the lack of instruction ... you decide. Who's it for: People who want a pressure cooker. Pros: Nice lid and pressure release functions. Wishes: This seriously needs a saute button and a slow cook button if it's supposed to have those functions. Also, I'm still not sure if it uses different pressure settings and/or different temperatures for different cooking functions. That would be useful to know, since there isn't a manual way to set both time and pressure level and since there are no saute or slow cook functions on the control panel.